Even if you value a beautiful smile in La Mesa, it’s easy to become somewhat neglectful about smile-friendly lifestyle choices. In today’s post, our goal is for you to analyze where you stand and think about whether you could step it up a notch. Committing to oral health best practices can prevent future problems and help you maintain a beautiful smile in La Mesa. Good: Brush teeth once a day. Better: Brush teeth thoroughly after each meal. Best: Brush after each meal and floss thoroughly before bed. Good: See your dentist if you get a toothache. Better: See Dr. Gray once a year even if you don’t notice any dental troubles. Best: Twice-yearly, have a comprehensive dental exam and professional dental cleaning at Jeff Gray DDS – Sedation & Cosmetic Dentistry. Good: Use a whitening toothpaste. Better: Use a whitening product at home. Best: Schedule an in-office tooth bleaching procedure. Good: Eat a wholesome diet. Better: Eat a healthy diet and limit sugary snacks and beverages. Best: Eat a nutritious diet, limit between-meal snacking, eat lots of calcium-rich foods, limit sugar-filled foods, abstain from energy drinks and soda, and sip water throughout the day to keep acid at bay. Good: Never put your child to bed with a bottle. When your toddler starts drinking from sippy-cup, don’t let them sip juice or milk all day. Better: Follow the previous guidance and schedule his/her first dental checkup before the first birthday. Best: In addition, communicate with Dr. Gray about dental sealants when your child is young. When your little athlete starts participating in sports, make sure they wear a protective mouth guard. Set a good example of daily dental hygiene and healthy lifestyle choices. At Jeff Gray DDS – Sedation & Cosmetic Dentistry, we are dedicated to helping our patients achieve a beautiful smile in La Mesa. We invite you to call 619-717-8560 to schedule an appointment. Our practice offers services such as dental crowns, TMJ treatment, and dental implants. We look forward to meeting you. Do you have a son or daughter that plays youth sports? Soccer, baseball, football, and basketball can be very dangerous for your child’s teeth. A mouth guard from Jeff Gray DDS in La Mesa can make a all the difference. 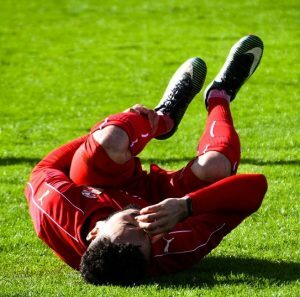 Football is a violent contact sport, yet there is a relatively low rate of tooth injuries that occur in football as compared to other contact sports. Why? Football players are required to wear a mouth guard and a helmet. Inexpensive athletic dental mouth guards are worth their weight in gold! If your child participates in a contact sport and does not currently wear a mouth guard, we recommend that you pick up an appropriately-sized mouth guard and make sure they wear it. They are available at most Ladera Ranch athletic supply stores. Some dentists make custom-made athletic mouthguards that deliver even better protection than the one-size-fits-all brands. At Jeff Gray DDS in La Mesa, we can get your child fitted with a custom mouth guard. We also provide dental implants, along with general dentistry. Make an appointment with us today.